Vuselela Energy with its award winning project Eternity Power Thermal Harvesting™ has won another prestigious award, the 9th Annual Africa Energy Innovation Award. “Launched in 2007, the Africa Energy Awards have become the blue chip mark of success for the Africa power and electricity sector. The awards recognize and reward industry innovation and outstanding performance, and honour the top energy projects and influencers throughout Africa”. Africa Energy Awards organisers, Terrapinn. 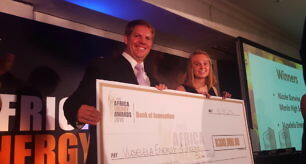 Vuselela Energy shares the R300 000 prize with 15 year old school learner Nicole Barwise, inventor of a urine powered battery. Read more about Eternity Power in this downloadable brochure. The award was received by Vernon Harding, Director at Vuselela Energy and Nicole Barwise from Menlopark High School at the Balalaika Hotel in Sandton.